“It’s that time of year again! Our annual triple IPA Un-Human Cannonball is nearly ready for release and is, as usual, joined by its little bro Human Cannonball Double IPA. If you’re unfamiliar with the beers, Human Cannonball is our 9.2% West Coast double IPA that we first brewed back in 2011 featuring copious quantities of bold and dank Citra, Columbus hops and fermented with neutral US ales yeast for minimal flavour interference. 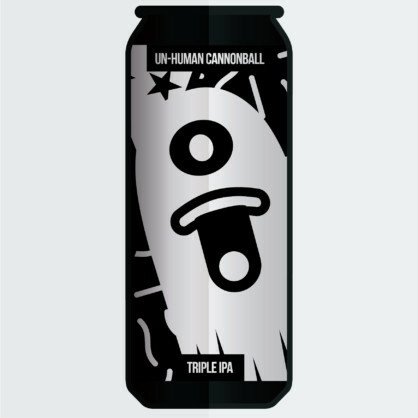 Un-Human Cannonball first came along in 2013 and ramps things up even further to pack in as much clean and drinkable hop flavour in as possible, all while masking its 11% alcohol content. In contrast to Human, Un-Human uses Amarillo, Centennial, Mosaic, Simcoe and CTZ hops for lots of lovely citrus and tropical fruit flavours. The idea with both of these beers has always been clean drinkability, packing in intense flavour while making them drink like much lower ABV beers unencumbered by harsh flavours such as hop burn and higher alcohols.